Open 7 Days a Week | 7 a.m. - 9 p.m. Welcome to Breeze Thru, your one stop drive-thru and convenience store located in Avon, NC. Family owned by the Kirks since 2007, Breeze Thru’s mission is to offer residents and vacationers a wide variety of products. We offer all you’d expect from a convenience store, but with so much more! 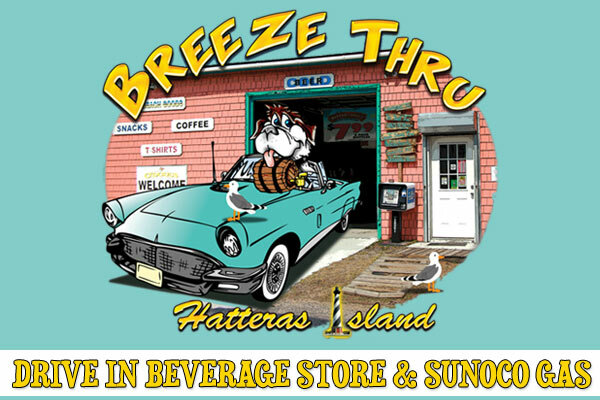 When you pull into Breeze Thru in Avon, you’ll find an extensive selection of beer and wine, tobacco products, beverages, ice and all the supplies you need for the beach. But it doesn’t stop there. Visit the adjoining Breeze Thru Annex and find many other items, including snacks, sunscreen, t-shirts and souvenirs, prepaid cell phone minutes, fishing licenses, lottery, ATM, propane and 5-gallon water jugs. Sunoco gas is also available on-site. At Breeze Thru, you'll be greeted with fast and friendly service. Our staff will load up your vehicle with beverages; you don’t even have to get out of your car! Imagine for a moment…One stop for gas, drinks, ice for the coolers, sandwiches for lunch, a cup of coffee, sunscreen and the enjoyment of a drive-thru experience. Gotta do the Breeze Thru! If you’re looking for kegs for a special event or gathering, look no further. We are the only store on Hatteras Island that sells kegs. Reserve yours today! We're open 7 Days a Week, 7 a.m. - 9 p.m.
Beer, wine, gas, prepaid cell phone minutes, cell phone accessories, fishing license, lottery, ATM, ice & much more! Drive-thru beverage store – Stay in your vehicle and we'll get your drinks for you!